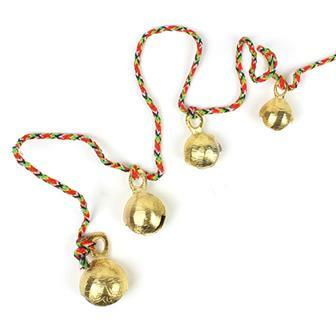 Jingling, jangling collection of various kinds of bells. 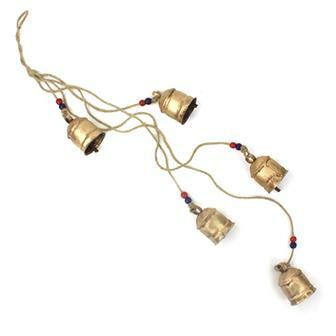 We stock a small range of bells stringed by a charitable women's group in India in addition to our very popular Tota strings of fabric animals. So add a little jingle to a corner of your home! 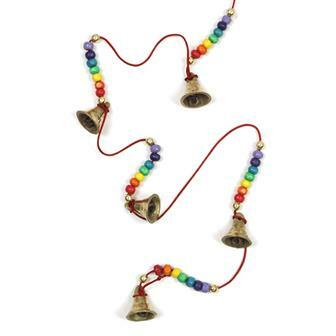 Delightful string of five Indian brass bells hung on a length of cord with vibrant rainbow wooden beads. This lovely little hanging makes a wonderful gentle jingle sound when hung in the breeze. 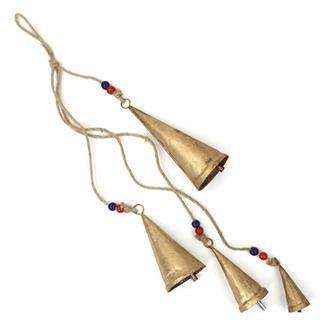 These stringed sets of beads and bells are made in India. Perfect for hanging or wearing. 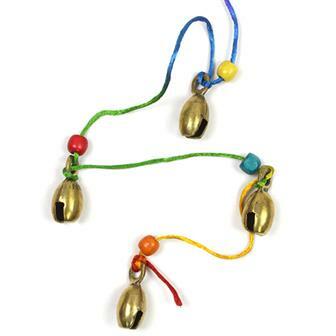 String of four large nutmeg shaped Indian bells traditionally used on ghungroos, hung on a length of brightly rainbow dyed string and finished with large wooden beads. 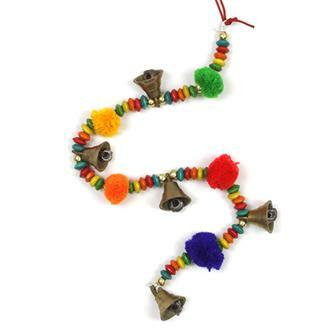 Small but mighty string of six Indian brass bells hung on string, jam packed with a riot of colour provided by wooden beads and vibrant mini pom poms. This cute piece of decor is certain to a splash of colour and sound to any room. 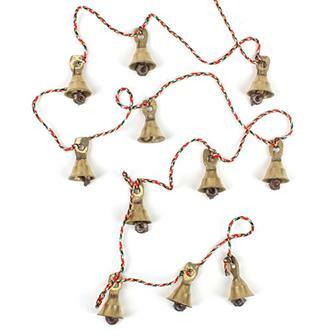 These stringed sets of 11 tinkling little bells are made in India. Perfect for hanging or wearing. 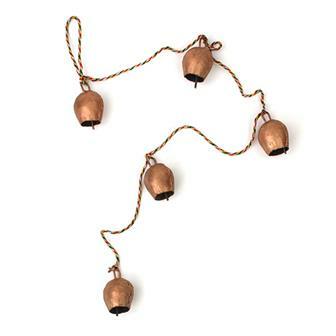 String of small rustic handmade ironwork bells with copper coloured paintwork, hung on a length of colourful string. 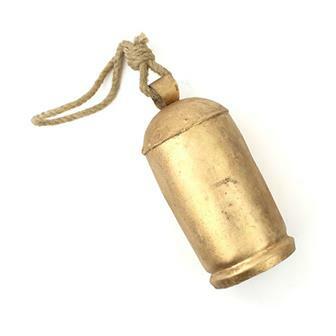 Each bell has a small metal clapper which produces a subtle tinny sound. 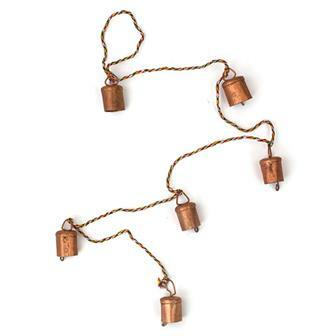 These large rustic cow bells are tied onto a suitably chunky length of rope and knotted with a loop for hanging. Great for hanging up in the house, wearing on your person for a noisy strut or for putting on your prize cow. Large rustic cow bell suspended on to a suitably chunky length of rope. 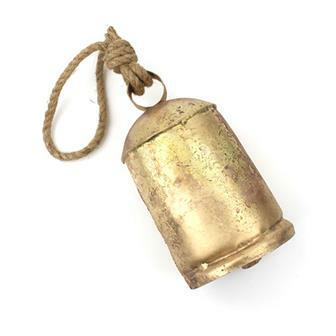 These handmade, vintage style ironwork bells have a gold painted effect, a charming rustic finish and a wooden clapper. Each bell produces a pleasing sound reminiscent of sea bouys. Extra large rustic cow bell suspended on to a suitably chunky length of rope. 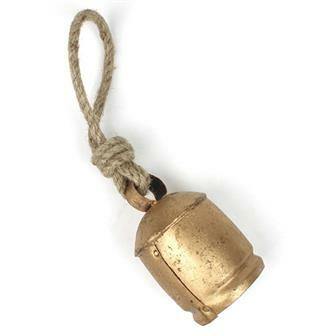 These handmade, vintage style ironwork bells have a gold painted effect, a charming rustic finish and a wooden clapper. Each bell produces a sound reminiscent of sea bouys. 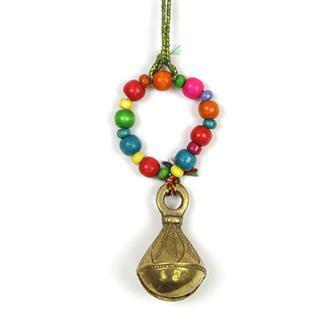 Chunky brass bell with leaf design hung on a loop of multicoloured wooden beads. This cheery little item is sure to bring a smile to faces with its bright colours and ring. 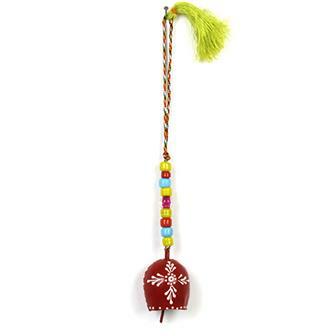 Small Indian brass sleighbell with mandala patterning on a small length of string decorated with a mix of metallic coloured and bright wooden beads and finished with a multicoloured pom pom. 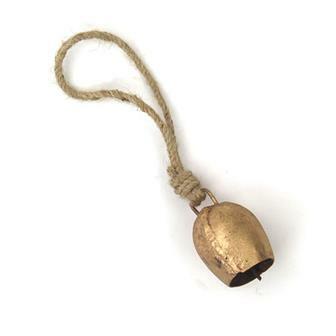 A single rustic bell with an interesting bulbous shape, hung on a length of thick twine knotted with hanging loop. These handmade ironwork bells have a vintage look and feature natural flaws which adds to their character. 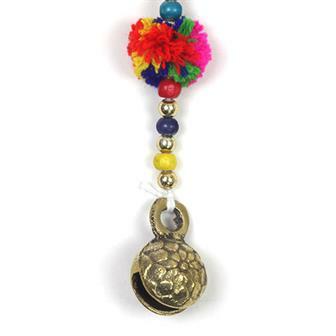 Super cheery rustic Indian bell in bright colours with hand painted design on a length of colourful threaded rope complete with chunky glass beads and coloured tassel. 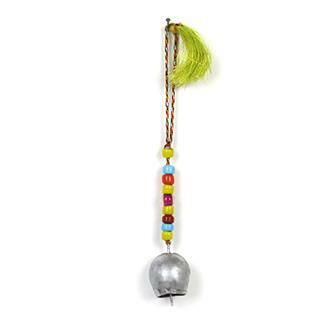 Jingly bulbous metal bell suspended on a length of colourful string with large glass beads and colourful tassel. 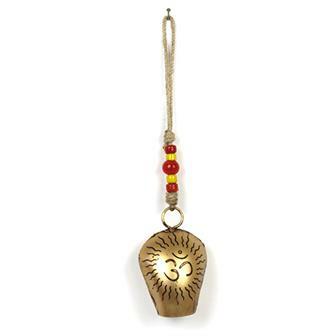 Chunky rustic Indian bell etched with an ॐ Om symbol on a length of rope with glass beads. 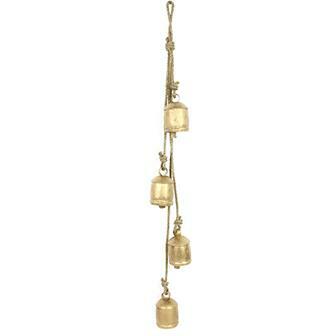 Five medium sized rustic ironwork bells suspended on a length of thick twine decorated with large glass beads. This great chime acts like a windchime producing a quietly pleasing metallic sound.